At this time of the year, the English and Australian flavours of rugby league seem to be worlds apart. The freezing, boggy pitches along the M62 don’t exactly appeal to players and fans sweating it up on the east coast of Australia, who are eagerly awaiting the start of a new season. Those stark differences are one reason why the idea of a poor man’s Champions League, where Super League and NRL premiers go head-to-head for the right to call themselves ‘World Champions’, is not such an easy sell. It shouldn’t be this way, but this is rugby league, where things are never as simple as they seem, and myopia is often the default setting. The truth is, Wigan is a long way from Bondi. It’s a tiny blip in the north west of England; a historic hamlet that makes up part of Greater Manchester and just happens to be one of the world’s few genuinely rugby league-mad towns. My first trip was for a World Club Challenge, when my beloved Cronulla Sharks played Wigan Warriors in 2017. From the minute I walked out of Wigan Westgate station, I witnessed a special kind of energy; every shopfront on the high street had posters advertising the match, match-day scarves were being hawked, and every pub was bursting at the seams with cherry-and-white-clad patrons. It pains me to say that these scenes even rivalled what I witnessed in the Shire on the eve of the 2016 grand final. The unfortunate thing was that no one seemed to tell the Sharks. They appeared to treat the fixture as nothing more than a pre-season holiday, staying far away in London, with limited news to come out of camp. Unless you count the team trips to the London Eye and Westminster Abbey, the Aussie side removed themselves from the build-up and therefore misread how much this game meant to the Wigan Warriors and the region. Cronulla were duly embarrassed on the field. The fact that they scheduled a trial back in Australia at the same time and split their playing group clearly signalled their intent. Fans who made the long journey to the UK to watch the Sharks win another trophy (because, let’s face it, there is still plenty of room in the cabinet) were left reeling about the result. Rugby league in the UK is a small but passionate world. The vast majority is played along one motorway, which dissects the country from Liverpool in the west to Hull in the east. But make no mistake, these devoted fans dotted along these proud pitt-and-mill towns adore the NRL, and they see the World Club Challenge as their chance for their teams to match it with the best in the world. If you look at it through English eyes, the fixture is a major event. On the flipside, NRL clubs only wish to directly prepare for a gruelling season. But what needs to be the default position is that the World Club Challenge is part of a title defence and therefore should be factored into pre-season preparations. When Australian clubs become recalcitrant about scheduling, or treat this game like nothing more than a trial, it cheapens the event and allows an already jaded media to ignore it. It is also a missed opportunity for the NRL and its clubs. If they get behind the fixture, fan interest will follow. Almost every Super League fan owns some NRL apparel, so there is a big opportunity for antipodean teams to grow their brand. 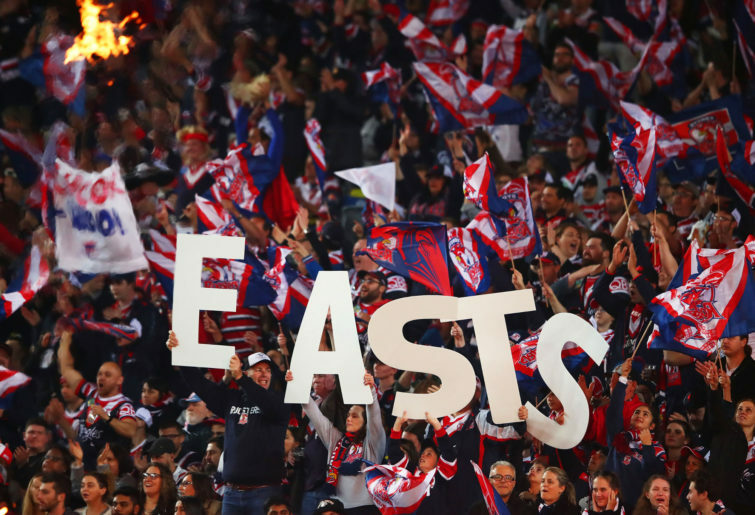 This year, the Roosters have the chance to become everyone’s ‘Aussie team’ – and what organisation would say no to more fans? The February 17 fixture will be a cracking affair. Boyd Cordner and Sean O’Loughlin – captains of their respective countries – go head to head, Wigan caoch Adrian Lam is taking on his old club, and Warriors recruit Zac Hardaker takes on Roosters gun James Tedesco. These narratives alone are worth the price of admission (or the early wake up), never mind a shiny trophy and bragging rights to boot. In an off-season saturated with news of horrible off-field incidents, as well as an absurd coaching merry go round, rugby league is crying out for some on-field action and a showdown between an original Northern Union member against a NSWRL foundation club is enticing. It is impossible to manufacture passion, it has to be grown organically. The history of this match shows that it can be a success, but in Australia the game constantly gets overlooked. Last year, the Storm refused to go to the UK, so the Leeds Rhinos had to play here. This year, it has been reduced from a six-team series (three Super League and NRL teams) to one standalone game. But it could be the springboard to a great season. Super League is the same game but so different. It’s played in small, suburban grounds, with terraces packed with crazy, chanting Northerners. Places like Wigan adore their team and often refer to players as their boys. At a time when the game sometimes bumbles along in Australia in stadiums with seas of empty seats and almost zero atmosphere, we need our players to witness that the game is bigger than that. Jordan Lilley had only played a handful of games off the bench for Leeds when injury decimated the team in 2016 and he was called up to start in the World Club Challenge, against a handy player named Johnathan Thurston. Although the under-strength Rhinos were duly beaten, Lilley recalls running out in front of his home crowd – screaming Yorkshire folk – to take on the world’s best as a career highlight. When he talks about it you can almost see the passion. Rugby league deserves to hear these stories more. I just hope the NRL comes to realise that before the fixture is relegated even further down the pecking order.